“In 1978, when I thought of creating a flag for the gay movement, there ws no other international symbol for us than the pink triangle, which the Nazis had used to identify homosexuals in concentration camps. Even though the pink triangle was and still is a powerful symbol, it was very much forced upon us. The original Pride flag designed by Gilbert Baker in 1978 has 8-stripes. Colors were removed and changed originally due to fabric availability. Gilbert Baker was born in Kansas in 1951. From an early age he was fascinated with fabrics and color. He attributed this early interest to the women’s clothing store which was owned by his grandmother. Even with that family connection, though, in small town Kansas in the 1950s no one thought a boy should learn to sew. In 1970 the 19-year-old Gilbert was drafted into the army, where he was trained as a medic and stationed in San Francisco, where he treated soldiers who had been wounded in Vietnam. When Harvey Milk was elected a city supervisor, becoming the first openly gay man elected to public office in the U.S., he had worked with Gilbert a few times in relationship to those rallies and protests. And so when Milk thought that the community needed a new symbol to unite around, he asked Gilbert to create it. Recreation of the second version of Baker’s original rainbow flag for the ABC miniseries When We Rise. Photo Credit: Ron Koeberer via ABC. The Gay Freedom Day Committee provided money, and the Gay Community Center provided working space. 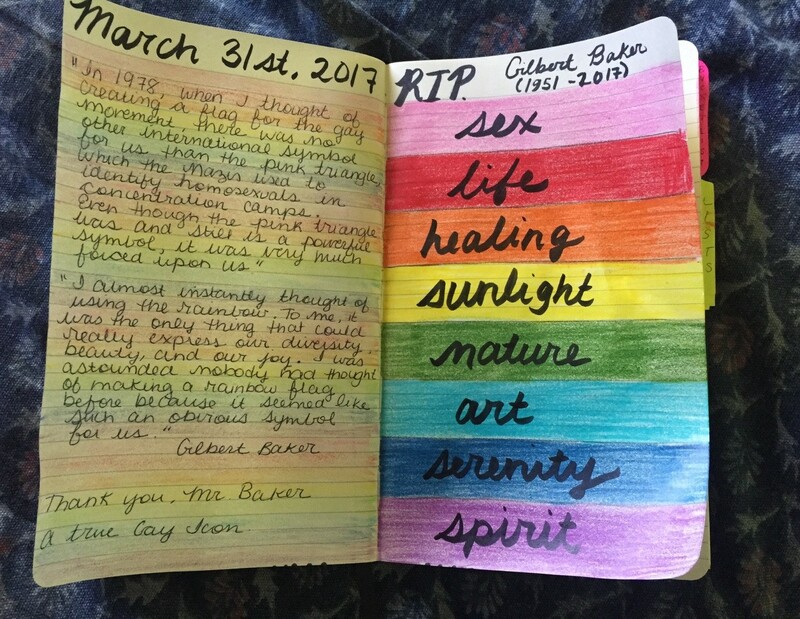 Gilbert Baker and approximately 30 friends gathered together with over a thousand yards of cotton fabric and a lot of bottles of dye, and carefully created fabric in eight colors: hot pink, red, orange, yellow, green, turquoise and violet. Gilbert also worked with Fairy Argyle, who was known as the Queen of Tie-Day, to create a square of blue fabric that had tie-dyed stars on it, to evoke the field of stars on the U.S. flag. Gilbert sewed two different flag designs in 1978, the first was the 8-stripe rainbow, the second one looking like the American flag, but with the tie-dyed stars and rainbow stripes. Five months later, Harvey Milk was assassinated, and the community was thrown into mourning. Thousands gathered that night in the Castro, that marched to city hall where they held a candlelight vigil. In the following days, people began asking for rainbow flags. To meet the sudden demand, Gilbert worked with the Paramount Flag company to mass produce flags. They used a then stand available rainbow fabric with only seven stripes: red, orange, yellow, green, turquoise, blue, and violet. 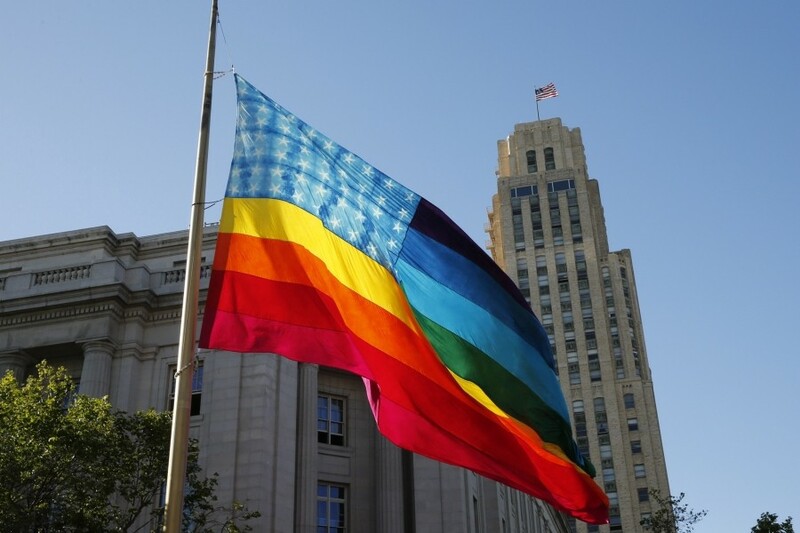 The Freedom Day committee wanted larger flags for the next Pride Parade, and Gilbert went to work, dropped the hot pink stripe from his larger hand-sewn flags in part because the dye was difficult to obtain, and no one was manufacturing stock hot pink fabric. And the next year he dropped another stripe. Some say that the turquoise was dropped because when the flags were hung vertically from city light poles the middle stripe wasn’t visible from other angles. Gilbert said that turquoise and indigo fabric was difficult to obtain, so he switched to a navy blue stripe. I’ve written before that the rainbow flag was not immediately embraced by everyone in the LGBT+ community. In fact, it was considered more a regional thing until a court case in 1989, when a West Hollywood man had to sue his landlord for the right to fly the rainbow flag from his apartment balcony. In 1994 Gilbert supervised the creation of the first mile-long rainbow flag to commemorate the 25 anniversary of the Stonewall riots. The flag was cut up afterward to make smaller flags. Some sections were sold as a fundraiser, others were distributed to Pride Parade committees in other cities. In 2003, the 25th anniversary of the creation of the rainbow flag, Gilbert was commissioned to create another giant flag. This one was one and a quarter miles long and was carried in the Key West, Florida Pride event. It was eventually cut into 100 slightly less giant flags and again distributed to various cities around the world. 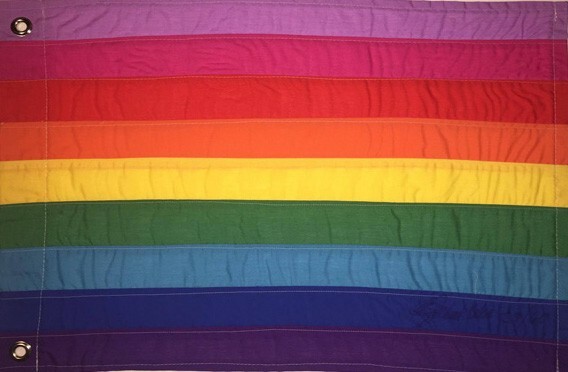 Gilbert often described himself as the Queer Betsy Ross and was sometimes asked to give his blessing to some variants designed by others (such as the Victory Over Aids Flag, which used a lighter violet and had a black stripe to symbolize our mourning for those who have died of complications of AIDS). It is worth noting that except when he was directly commissioned, Gilbert didn’t make money from his creation. In his later years he struggled financially. But the one interview I saw where someone asked him about it, he said it would have been wrong to try to trademark the design. How could it be a symbol of our tribe if it legally belonged to one person? After 2003, Gilbert started lobbying for a return to the original 8-stripe version, so far to little avail. When Barack Obama was elected President, Gilbert hand sewed an 8-stripe version as a gift to Obama, and during the Obama administration that flag was displayed in the White House. Gilbert redesigned the flag one more time before he died. The election of Trump prompted him to add a 9th stripe, lavender for diversity or resistance. He sewed 39 by hand before his death, and they were used in the following San Francisco Pride Parade. When I was first coming out of the closet in the late 80s, pink triangles were the symbol I saw around the Seattle queer community. You could find pink triangle buttons and key chains and bumper stickers and so forth in every store in the gayborhood. There were rainbows, as well, but the pink triangle outnumbered them. Then in the 90s, when suddenly there were rainbows everywhere, especially at pride, there was a bit of a backlash. I heard more than one person grumble about rainbows everywhere. But I think Gilbert was on to something. The pink triangle was forced on us by oppressors; it was also most often used to identify gay men in the concentration camps—therefore many lesbians felt the reclaimed symbol didn’t include them. There is something joyful about the bright colors of the rainbow flag. The different colors side-by-side can signify that diversity Gilbert talked about: different races, different genders, different generations of queer people. And I confess that as long as anti-gay religious wingnuts have conniption fits about us supposedly stealing the symbol from god, I’m going to take a bit of delight in raising my own rainbow flag. And it isn’t just about sticking it to the haters. Rainbows appear in the sky after a storm. They are beautiful and ephemeral and otherworldly. It’s difficult to look up at one in the sky after storm clouds have cleared and not feel at least a bit of wonder. As queers we encounter a lot of storms in life. We may be bullied as kids. We may face discrimination and even physical assault as adults. We achieve a small victory, and then face a conservative backlash. In my lifetime there have been campaigns to pass laws to bar us from certain professions, even as courts and civil rights laws open some doors for us. The AIDS crisis killed tens of thousands, and it wasn’t just Republican politicians who laughed at our suffering during the 1980s. But every tempest and onslaught that we weather makes us a stronger. We have setbacks, but we fight on, moving ever forward. Like the rainbow, we shine on after each storm.